The current 1st and 2nd year Licentiate in TCM students have just completed their end of year exams and we wish them a good break over the summer period. Successful students will commence the Teaching Clinic on 22nd September 2018. The Certificate in Medical Qigong (Cert.MQG) Group 1 students have only one final assessment day to complete. This will take place in mid-September, after which they will be qualified as MQG practitioners. The Certificate in MQG (Group 2) students will complete Module One on the first weekend of September. Diploma in Herbal Medicine – students are reminded that the next session is running from 7 to 9 September 2018. 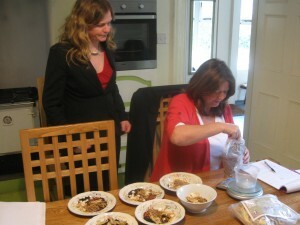 The photo shows previous students learning to dispense herbal medicine prescriptions. Autumn dates for an Introductory and a Follow-up Qigong workshop are currently being planned and will be announced shortly. The Irish College of TCM’s main part time undergraduate level programme of Professional Acupuncture Training is called the Licentiate in TCM. Students from any background (including a non-medical one) can train to become an Acupuncturist and can, on graduation from this part-time, 3 year programme, setup in practice as a qualified and insured TCM Professional. Acupuncture and TCM are at the forefront of Alternative approaches to health and illness, focusing as they do, not only on treating and curing current illness but also on disease prevention and health enhancement and public demand for well-qualified, fully insured practitioners is high. Licentiate in Acupuncture TCM (October 2018) – part time undergraduate level training. The Licentiate in TCM application pack has recently been updated. Details of the course can be seen by clicking the name above. 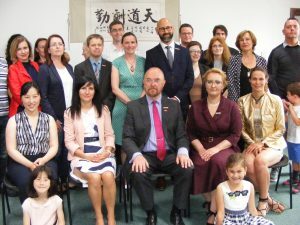 The Irish College of Traditional Chinese Medicine (ICTCM) is delighted to congratulate the recent graduates of the Lic.TCM Professional Acupuncture training programme. The four new practitioners received their Licentiates at a graduation ceremony in Dublin last Sunday which was attended by the President and staff of the College and invited guests. The photo below shows the group with the College Registrar at the start of their Clinical training year in September 2017. 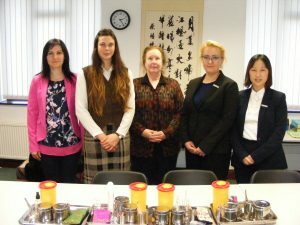 Soon our Licentiate in TCM 2018 graduates will be receiving their graduation certificates and we will be turning our attention to further enhancing and developing our Professional Acupuncture TCM training course which has been running successfully in our College in Dublin for more than 35 years. It is designed for adults wishing to work in a caring profession, whatever their current career, profession or experience. In only 3 years of part time study we provide theoretical and clinical training to a high standard which will enable our graduates to confidently and professionally set up in practice within the field of Traditional Chinese Medicine in any part of Ireland and/or the UK. You can access our course information, including course fees and payment plans from this online link. 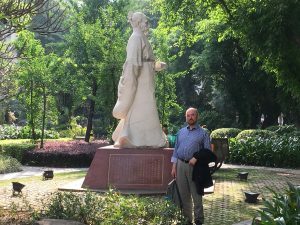 The photo shows the college founder and Principal Tom Shanahan at Guangzhou University of TCM during a recent official visit to China. Soon another group of students who are training to be Acupuncture professionals at the Irish College of TCM in Dublin will be Graduating from the Lic.TCM course. Second year students, such as those shown here learning to locate Acupuncture Points on the back, will be going into the Teaching Clinic to do their practical training. Would you like to be one of the new first year students studying to change career and become an Acupuncture TCM practitioner? It takes a little under 3 academic years of exciting, sometime challenging and always interesting part time study. We are now accepting applications for the October 2018 start date. The Prospectus Pack is available online at.www.ictcm.ie. Enjoyed ICTCM News? Share with a friend.